CarGurus has 86,227 nationwide Equinox listings starting at $800. Due for a comprehensive overhaul in the minds of reviewers, Chevrolet’s 2016 Equinox compact crossover promises more than a few nips and tucks in its attempt to keep up in a dog-eat-dog market. This pint-size ute returns as a 5-door, 5-seat family or commuter car and remains offered with a bunch of trim-selective standard features and a choice of 2 engines, while it also can again be delivered with either standard front-wheel drive (FWD) or available full-time all-wheel drive (AWD). Among the changes to the 2016 Equinox is a marginally realigned trim lineup that returns the base L mainly for fleet owners, along with, in ascending order of price, the LS, the LT, and the LTZ, with the upcoming year seeing the demise of the option-driven LT1 and LT2 selections. As for a sampling of the 2016 upgrades, Chevy’s quasi-ute receives a few tweaks to its front fascia, with the LT and LTZ trims getting revamped LED running lights and reworked wheels, while 17-inch alloy wheels are now available to the LS. Both the LT and LTZ will also offer a couple of added optional safety features, while all V6-toting trims are slated to sport standard chrome-tipped exhaust pipes. An upgraded center stack, finally, bolstered by a new-look shifter (with Electronic Range Selector) and some improvements to interior fabrics are also expected to debut in select Equinox editions. Powerplants, alas, return unchanged for the upcoming year, with a rather ho-hum 2.4-liter inline 4-cylinder engine and its accompanying 6-speed shiftable automatic transmission (with Eco mode) returning standard. Look again for 182 hp and 172 lb-ft of torque from the I4, with mileage again estimated at 22 mpg city/32 highway/26 combined in versions packing standard FWD, and 20/29/23 in AWD-equipped editions. Oh, and for those of you who might have a bass boat you want to trundle, this less-than-impressive engine can tow a maximum of 1,500 pounds with the proper equipment. Once again for 2016, the up-featured Equinox LT and LTZ trims remain eligible for a 3.6-liter V6 mill that remains mated with the 6-speed shiftable automatic to the tune of 301 hp and 272 lb-ft of torque. Of course, mileage drops significantly to 17/24/20 in V6-packing variations, and 16/23/19 in AWD trims, but towing capacity with the V6-toting Equinox jumps to a bigger-boat-friendly 3,500 pounds with the proper equipment. Appearance goodies for the quasi-new-look 2016 Equinox lineup include the already-noted upgrades to standard 17- and 18-inch alloy wheels, along with such repeats as heated power-adjustable mirrors, remote engine start, and, on the LTZ, a standard power liftgate. The LTZ with V6 power is also expected to return boasting firmer suspension tuning for a sportier drive. Inside, select trims feature upgraded cloth or leather upholstery, power-adjustable front seats, full power accessories, sliding and reclining rear seats, cruise control, and telescoping tilt-wheel steering. Meanwhile, lower trims get standard manual air conditioning, with higher trims again delivered with dual-zone automatic climate control. Additionally, look for the LT and LTZ to return sporting heated front seats and an auto-dimming rear-view mirror, with the top-shelf LTZ retaining standard memory for driver's settings, as well as rear parking sensors. Techno-bling in the lower 2016 Equinox trims is expected to remain basic Bluetooth-interfaced OnStar telematics with 4G WiFi capability and a CD player with 6 speakers and an auxiliary audio input. Higher trims are slated to again add such techno-goodies as smartphone apps and a Pioneer 8-speaker premium audio system and satellite radio to the list of standard equipment. Look for 2016 to see the return of such tried-and-true trim-dependent options as GPS navigation, a power sunroof, and rear-seat DVD entertainment, not to mention the extra-cost option of upgraded 19-inch alloy wheels. Reviewers and owners have traditionally lauded the Equinox cabin as decently roomy and well-equipped, if a tad on the noisy side. Cargo area for the 2016 editions, however, is expected to remain 63.7 cubic feet with the rear seatbacks folded, which is hardly class-leading. Look for returning standard safety features in the 2016 Equinox lineup to include 4-wheel antilock brakes (ABS), traction and stability control, front side-mounted airbags, and front and rear head airbags. Additionally, expect those aforementioned upgraded LED daytime running lights to be standard, along with the returning post-collision safety system, OnStar emergency alerts and communications, and a remote antitheft alarm. Again for the upcoming year, the LTZ sports standard front fog/driving lights, lane-keeping assist and a forward-collision alert, while both the LT and LTZ can be equipped with available (and new-for-2016) blind-spot and rear cross-traffic alerts. In government crash tests, this compact crossover, in its current iteration, scored 4 stars for overall safety, while the Insurance Institute for Highway Safety (IIHS) gives the 2015 Equinox its best rating of Good all around. When it goes on sale in the fall of 2015, the upcoming year’s Equinox will again be judged next to such rivals as Honda’s all-world CR-V, Mazda’s competent CX-5, Ford’s agile Escape, Hyundai’s spacious Santa Fe Sport, and Jeep’s rugged and versatile Cherokee. 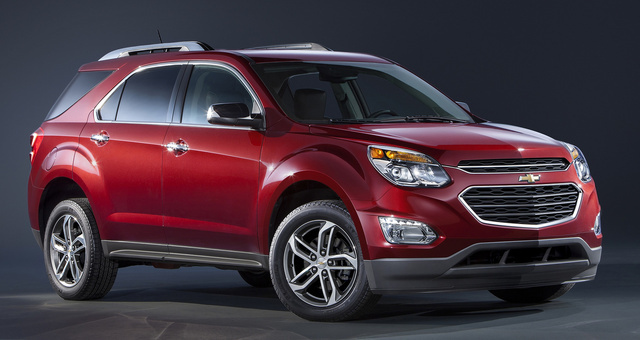 What's your take on the 2016 Chevrolet Equinox? Tom The 2LT 4 Cylinder lacks power on the highway and hills but does ok on ice and snow. I have second thoughts about the one I just leased and should have leased the 4Lt 6 Cylinder Chevrolet 2016 Equinox. TheHorror You should probably drive the car before you put your money down, Tom. Users ranked 2016 Chevrolet Equinox against other cars which they drove/owned. Each ranking was based on 9 categories. Here is the summary of top rankings. 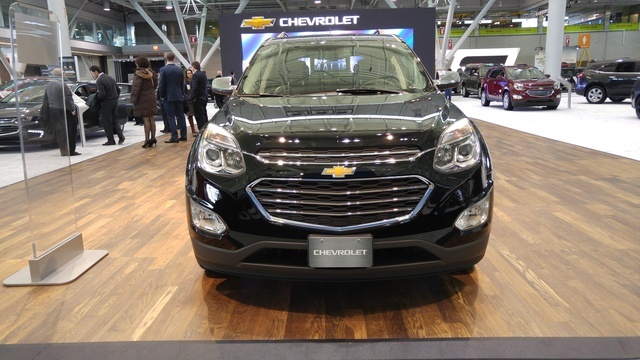 Have you driven a 2016 Chevrolet Equinox? My signal bars disappeared on my chevy equinox.now my xm says no signal, its not on XM side. What can I do? I replaced the battery in my 2016 Equinox LTZ at 18,500 mi. Since then the radio turns itself on and off as I drive and occasional warning messages. What is the cause? Do Any Of The Chevy Equinox Vehicles You Have Come With Sun Roofs?